If this effort succeeds without any significant adverse effects, “it would be the strongest measure to confront the anti-TTIP campaign, to start a new kind of communication and to show that the Commission will respond to the public,” Handelsblatt wrote, citing the document. Regulation of the Investor State Dispute Settlement (ISDS) “is one of the most important decisions to be made in the near future”, the paper said. German Economic Affairs Minister Sigmar Gabriel, in particular, has repeatedly expressed his support for concluding an agreement with the United States without controversial investor protection, via an extrajudicial international court of arbitration. “We agreed that we must create more transparency in negotiations”, Gabriel continued. TTIP is not only about free trade in a strict sense, but also about the EU and the US setting common standards for global trade. The Economic Affairs Minister said he fundamentally supports such an agreement between the two trade giants. 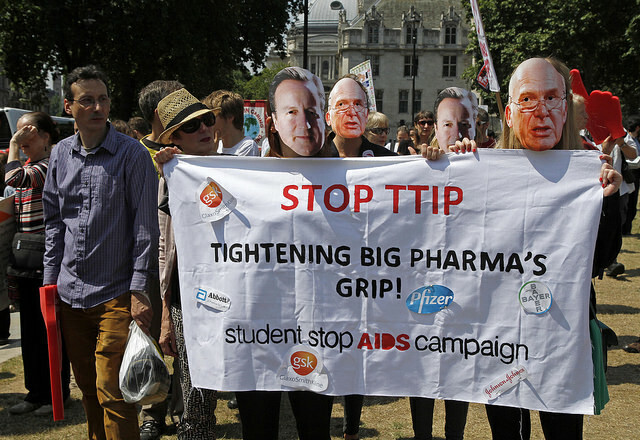 “TTIP is a gigantic geostrategic opportunity,” Gabriel commented. The planned arbitration procedure is highly controversially among the public. It would be designed to provide protection to commercial investors, but bypass a national court. Opponents of the measure are concerned over a lack of transparency in an arbitration procedure and fear that private companies, threatened with high damage claims, could indirectly influence government policy. Opposition to the free-trade agreement has intensified since the formation of the new, more eurosceptic European Parliament. If the agreement is ratified, it will bear upon almost 40% of global GDP. The Transatlantic market is the most important in the world in terms of goods and services. Economists have tried to determine which of the two continents has the strictest regulations. Out 100 risks factors (food security, air pollution, climate change, nuclear power, tobacco...), selected from 2878 identified over 34 years, they have been able to show that the level of precautions taken against risks is similar in Europe and the USA: the United States took greater precautions on 36 risks, the EU on 31. Exceedingly good news. The corporate world’s ongoing drive for power must be halted, then reversed. FINDINGS OF US SUPREME COURT DIFFER FROM CANADA’S, et al? “BUT, WILL CHINA SUPPORT PUTIN (B.R.I.C.S., et al); The WHITE KNIGHT”? TPP, CETA, C-CIT SHAREHOLDERS & NON Shareholders AWAIT SUPREME COURT of CANADA’S, et al, FINDINGS, et al, to PROCEED. “What the TREATY of VERSAILLES was to the 20th century (WWII) PALES in COMPARISON to the TPP, CETA, C-CIT, NAFTA, et al, in the 21st”.